Whose trees do you use? 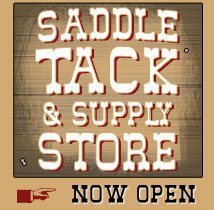 Do you sell your saddle trees? Whose leather do you use? What are the parts of a saddle called? What kind of ground seat do you have? What type of rigging is available? What are the advantages of the different riggings? 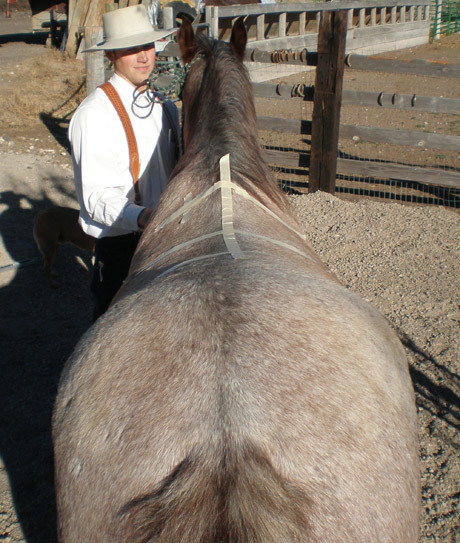 Is a wire tracing necessary to have before ordering a saddle? How do I take a wire tracing? 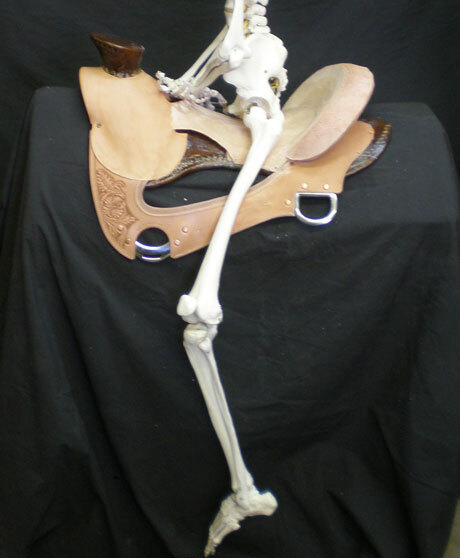 How long does it take to make a saddle? How much of a deposit is required to be on the list? 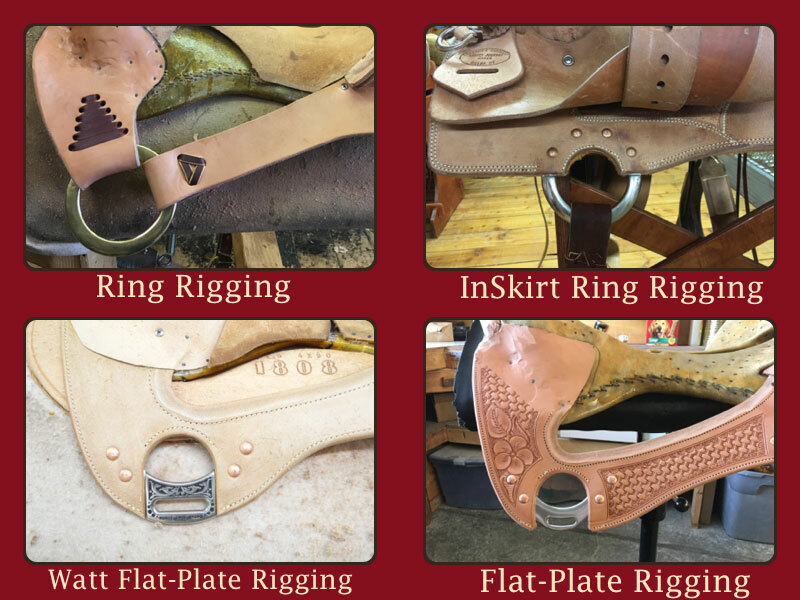 Do you do repair work on saddles? Do you make custom belts? What is the advantage of the rough-out leather versus the smooth? We make all of our own trees. 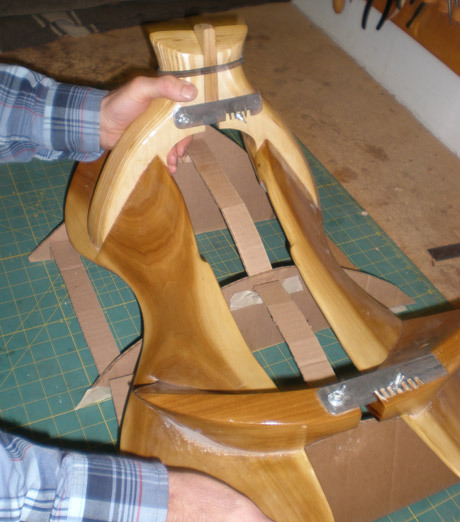 Learn more about our saddle tree making process by clicking here. No, we only use our trees for our own saddles. Herman Oak leather out of St. Louis, MO. Our ground seats are carved so when the rider is in a relaxed position his shoulders, hips, and heels line up. Therefore he is balanced and able to work well with his horse. 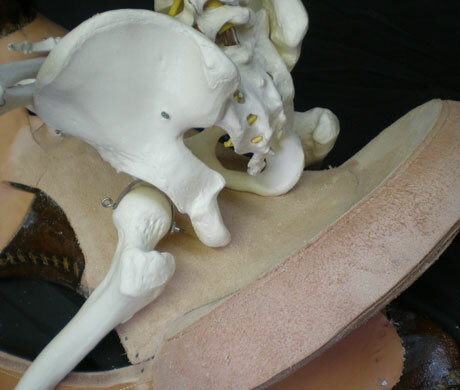 Here you can see that the rise in the seat is a gradual rise, the same curvature as the pelvis bone. So as the rider rocks with the motion of the horse there is no restriction. 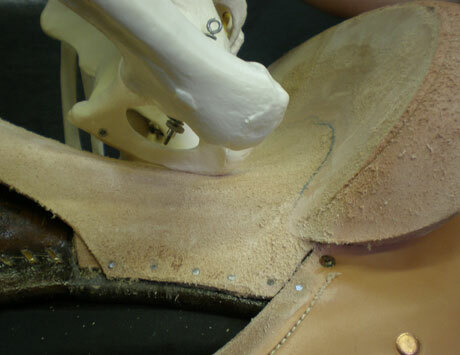 This shows that the two pin bones or pelvis bones are positioned in the lowest part of the ground seat and remain flat and not on an angle of any kind. This provides a more comfortable seat. The flat plate and inskirt are equally strong and positioned the same. The flat plate is the more traditional rigging for the Wade. The inskirt has less bulk under the rider's leg. Both provide a good swing for the stirrups. The round ring rigging can be positioned the same as a flat plate, but has less movement or swing in the stirrups. The double D is not used in a Wade but is popular on calf roping or team roping saddles. It is positioned higher and all the cinch pull is in the front, not spread evenly through the bars like the other riggings. How do you ensure that the saddle tree fits the horse? This is our number one priority. There are a number of different ways that we can do this. 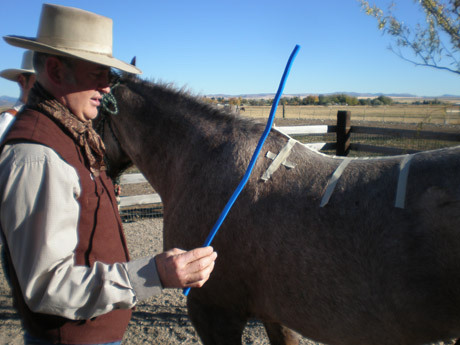 First, you can bend a wire over the horse's withers. 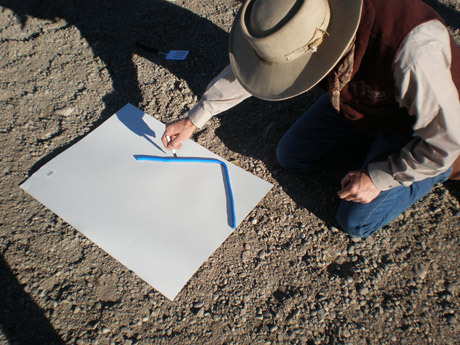 Next, trace the wire outline onto a paper. Then, mail the paper to us. 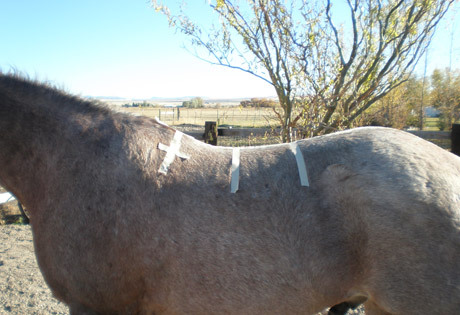 The second way is to bring the horse to the Frecker's Saddlery, and we will do the measuring. Third, there is a form you can buy that when heated will form to the shape of your horse. We can then use the form to get the necessary measurements. Please email or contact us for more information. 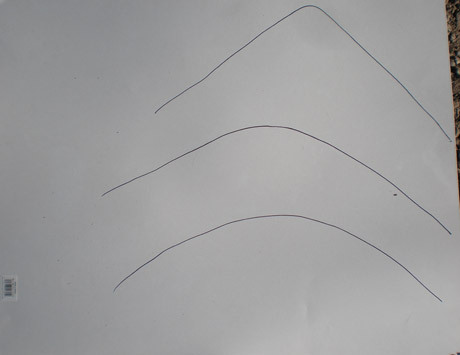 Is a wire tracing necessary to have before ordering or buying a saddle? In most cases no. The trees are made to fit the breed of horse. 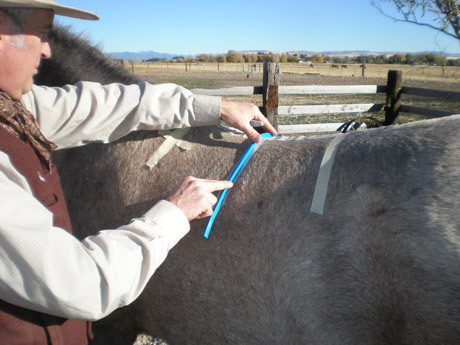 All horses backs change from year to year and season to season, but if there is a question, send in a wire tacing and have peace of mind knowing the saddle will fit. You will need a piece of soft wire such as a copper electrical wire or lead wire as shown above. 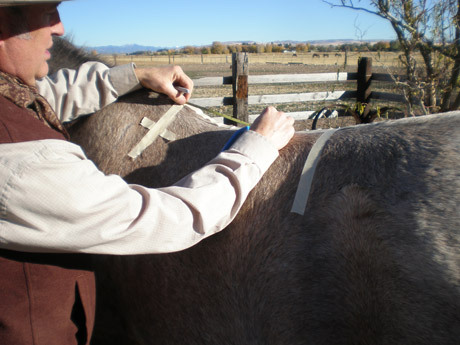 First mark your horse's back with tape starting directly over the "pocket" of the wither. Bend the wire over the tape and carefully remove. Repeat this with each mark. You should have three tracing on the piece of paper. Mail them to us along with two photos of your horse. 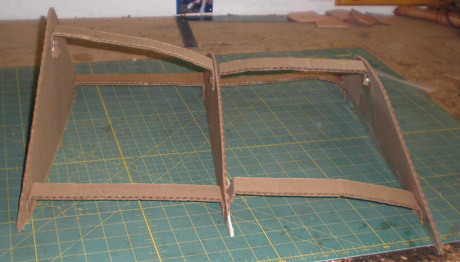 The cardboard is then evenly spaced eight inches apart to match the spacing of the wire tracings. Then I use a special jig that I designed to determine the bar spread, angle and rock needed to fit. We accept deposits for a year out, then stop so that we don't make the customer wait longer than one year after making a deposit. A $1000 non-refundable deposit is required to be placed on the list. The balance on the saddle needs to be paid before we build the saddle. Only on our own saddles. 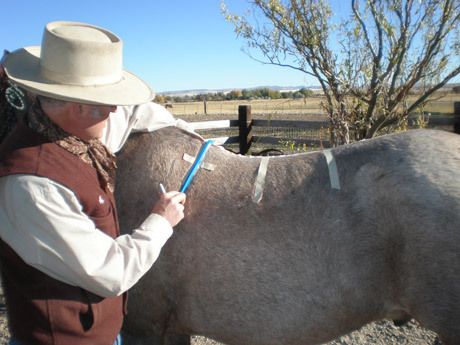 The rough-out is popular with cowboy and horse trainers because of its simplicity. It is easy to care for; just brush off the dirt & oil, no saddle soaping. The rough-outs don't scratch or mark, and you don't move in the seat as much. The smooth-out, on the other hand, holds up better in bad weather because you can use leather creams to condition and weather-treat. The smooth leather actually grips better when riding with chaps than rough-out. Smooth leather requires more maintenance to soap and clean. 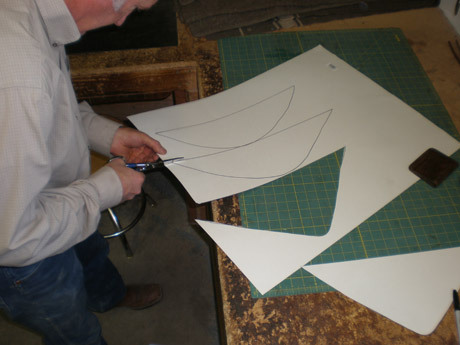 Smooth leather can have more intricate tooling than rough-out. The simple answer is NO. The term "Wade" is the name of the style front that the saddle has. The fit is determined by the tree maker and the bars he uses. 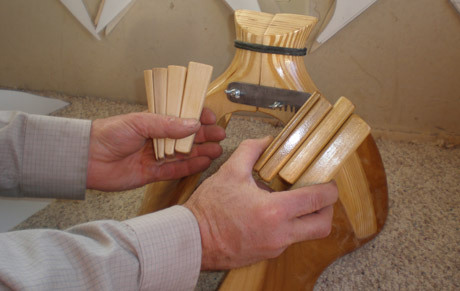 Most handmade tree makers use a larger, wider bar for their Wades, which gives more surface area to contact the horse, which spreads the pressure out on the horse's back. The same bars can be used with a variety of front styles, giving the same fit. The opposite is also true - with most production made trees, a narrower and straighter bar pattern is used on all their front styles, so a "Wade" style front from them won't fit any better than the rest of their trees.